In a city famous for its impressive ceilings—think that of the Sistine Chapel—Rome’s Church of the Gesù is a standout. The massive three-dimensional trompe l’oeil ceiling frescoes are so extraordinary that a large mirror has been strategically positioned so visitors can enjoy without straining their necks. The baroque Chiesa del Gesù (Chiesa del Santissimo Nome di Gesù all’Argentina) is one of the main churches of Rome, and a visit is often included in walking tours of the city's most important historic and artistic churches, such as Santa Maria degli Angeli e dei Martiri, San Luigi dei Francesi, and Santa Maria sopra Minerva. You can combine a visit to Church of the Gesù with skip-the-line Vatican tickets to also tour St. Peter's Basilica, or opt for an audio-guided tour to visit this and other attractions at your own pace. The church was built in the 16th century to replace an older Jesuit church marking the spot where the founder of the Jesuit order, Saint Ignatius of Loyola, once prayed to an image of the Virgin Mary (still preserved inside). The ornate frescoes over the nave and inside the dome by Giovanni Battista Gaulli date from the 17th century and feature clever trompe l’oeil effects. Remember to wear clothing that covers your shoulders and knees to enter Catholic churches in Rome. 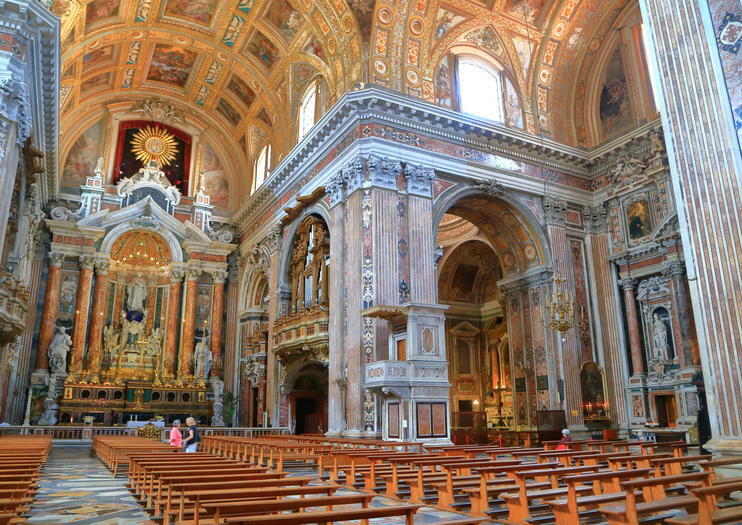 Tours of Rome's churches require quite a bit of time on your feet, so wear comfortable shoes. Due to the stairs at the entrance to the church, it is not accessible to wheelchairs or strollers. Church of the Gesù is located along Via degli Astalli on Piazza del Gesù right in the center of Rome, a quick walk from Piazza Venezia where many buses and tram lines stop. Rome is one of the most popular destinations in Italy, and its most famous churches can be crowded during the busy summer season. Try to visit first thing in the morning or late in the afternoon to enjoy the ceiling decorations in relative peace. Other highlights of Church of the Gesù include the sumptuous side chapels, namely the Cappella di Sant'Andrea, the Saint Francis Xavier Chapel, and the Chapel of St. Ignatius, designed by Andrea Pozzo. Visit Rome’s baroque churches on this walking tour that introduces you to sites not usually included in the average Rome sightseeing itinerary. As you check out places like the Church of San Giovanni de Fiorentine and the Church of Santa Maria Sopra Minerva, you’ll learn about the history of baroque architecture and its purpose by artists like Francesco Borromini, Giacomo della Porta, Carlo Moderna and Pietro de Cortona. See and learn about the largest and most important churches in Rome's majestic city centre on this fully private and exclusive walking tour! Historic Churches of Rome plus Skip-the-Line Vatican Ticket will take you back to Medieval, Renaissance, and Baroque Rome inside five magnificent buildings which most tourists rarely see. Time spent with your local expert guide is approximately 3 hours. After your fully private tour experience, you will be given priority access, skip-the-line tickets into the famous Vatican Museums for the self-guided portion. Recommended time inside the Vatican Museums c. 2 hours.